If you came to 61st and Eberhart on the weekend of Sept. 21st, you would have been greeted in Greenline coffee with some free mochas and cookies baked by one of our Sunshine Enterprises graduates Ava Gordon, owner of Agortles Baked Goods. You may have talked with manager Ashley James about the how Greenline began in 2014 and the impact it has on the West Woodlawn community. From Greenline, you would have made your way next door to the Sunshine Enterprises Coworking space, a bright and inviting office space that entrepreneurs share to conduct business, collaborate, and meet clients. You may have spoken with Bartell Keithley, a graduate of the Spring 2018 cohort who is opening a coffee shop in the Old Morgan Park neighborhood. Navigating the logistics of permits, investments, projections, and loans has been a long process for him. He continues to draw on the knowledge and support of the Sunshine Enterprises network to forge ahead with his dream. Sunshine Enterprises staff Laura Lane discusses the work SE does with local entrepreneurs. Heading next door to the youth space, you have the opportunity to see Middle School, High School, and young adult programs. You may have heard High School Director Lamar Simms share about the importance of transitioning youth from elementary, to middle school, to high school. Arnold Sojourner, who oversees many of the programs geared towards young adults also emphasized the importance of continued presence in the lives of the youth, regardless of what stage they are entering, always showing love. Or he may have shared the need for mentors for some of these young people through our MentoringLife program. Crossing the street to the Elementary youth space, you would have been welcomed by the Wheaton in Chicago program. 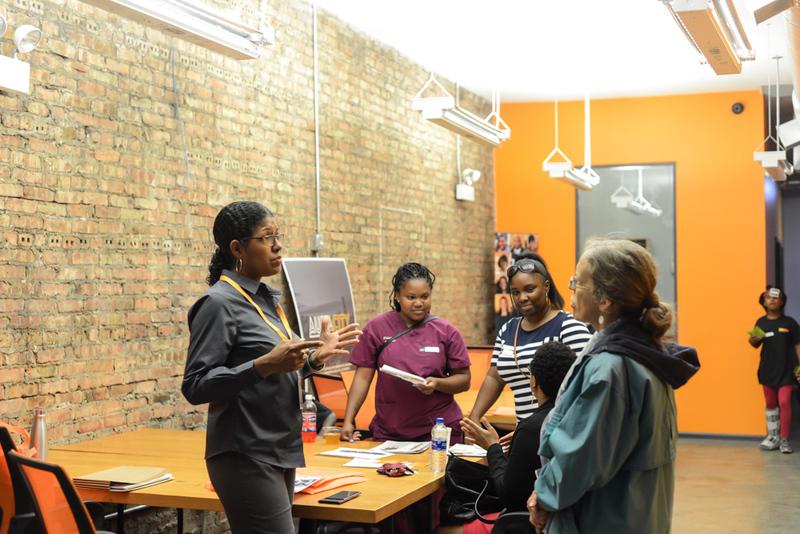 Current Wheaton College students shared how Wheaton’s internship and study program came to the Woodlawn neighborhood, partnering with Sunshine as students seek to delve further into their understanding and experience of the southside of Chicago. Currently 14 Wheaton students are housed in Sunshine’s buildings as they study and intern in the city. Entering the large common space, you may have noticed kids’ artwork, participated in crafts lead by some of the youth staff and kids, or had a conversation with Jeremiah Holmes, elementary youth staff, about the benefits of taking students to summer camp at Kids Across America. He proudly spoke about the students who attended, and how stepping out of their comfort zone to a completely new environment facilitated tremendous growth. If you were lucky, you would have heard one of the elementary students proudly recite their verse of the week or resilience creed. 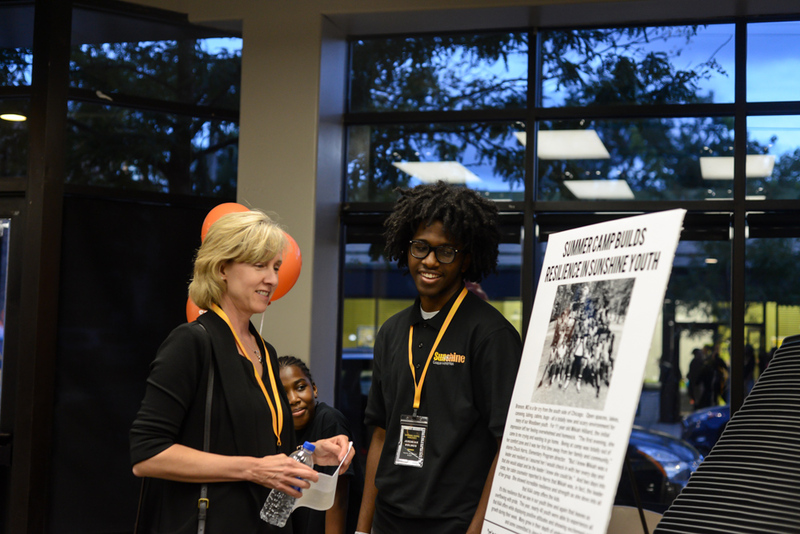 Youth staff Jeremiah Holmes shares the benefits of taking kids to summer camp with one of Sunshine Gospel’s board members, Kim Lodewyk. Making your way through the hallways, you would have stopped by the BridgeBuilders booth to hear from Director Tim Baldwin about the various service-learning opportunities facilitated at Sunshine for youth groups, college groups, or church groups. He may have told you about the exciting community partners such as Dulles Elementary and Bill Hill Gardens, or given you insight into some of the topical discussions BridgeBuilders leads on race, poverty, and justice. The final destination in the Open House tour takes you the the FamilyHood table, lead by Director Sasha Simmons. Sasha highlighted the 12 week curriculum Raising Highly Capable kids that focuses on the 40 developmental assets, and is a parent-lead course that takes place in community centers and local schools. Sasha has also worked with the Sunshine Youth staff to incorporate these assets into their weekly curriculum. Your weekend may have also included a bus tour of Woodlawn, lead by Executive Director Joel Hamernick. Driving through important historic sites in Woodlawn to honor the history of this community, he discussed the challenges and opportunities that lie ahead as the Obama Library gets built on the Eastern edge of Woodlawn, just a mile away from us. We continue to talk about how gentrification affects the community, and the ways Sunshine can be an integral part of all that’s happening in Woodlawn. You would have felt the joy and resilience of our community on Friday night at the Open Mic performance at Greenline Coffee. Middle School girls performed interpretive dance. Sunshine staff and local artists performed poetry, rap, and worship that celebrates not only the joy but also the pain and difficulty of our shared experience living in this complex and beautiful neighborhood. If you did not have the chance to experience Sunshine during the Open House, we invite you to come and visit us and find ways to be involved! 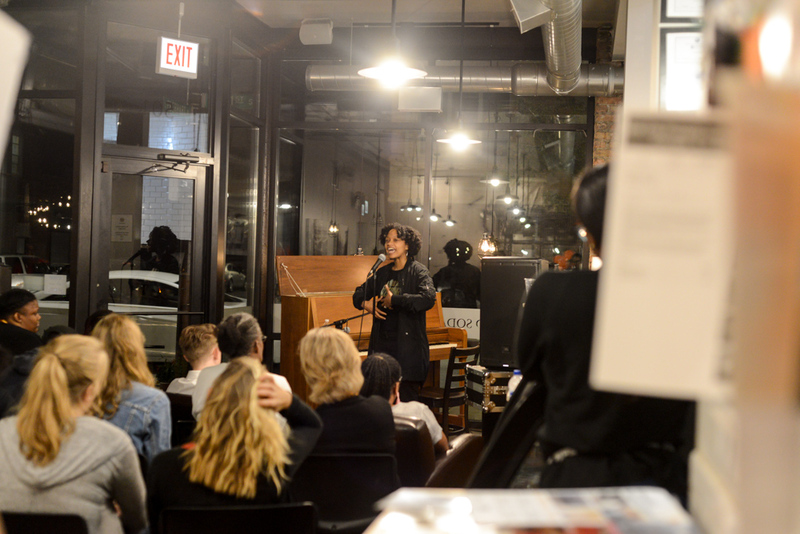 Community artist Aasha Frances performs a heartfelt poem during the Open Mic at Greenline Coffee on Sept. 20th.